Gawler Airfield Squadron in South Australia recently had a visit from Pilot Officer Lachlan Johnston of the Royal Australian Air Force. Lachlan recently was awarded his “Wings” having successfully completed and graduated from RAAF Pilot’s Course. What made the visit even more special is the fact that Lachlan is a former junior officer in the Australian Air League and a member of Gawler Airfield Squadron. Two years agoLachlan left his home town of Kapunda and joined the RAAF. He completed Officer Training School at RAAF Base East Sale and then was posted to No 1 Basic Flying Training School at Tamworth where flew CT4B. Lachlan was then posted to No 2 Flight Training School at RAAF Base Pearce to fly the PC9/A. 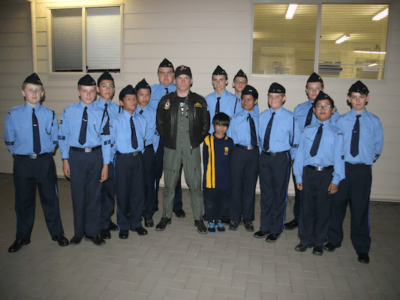 Lachlan answered questions from the Gawler Airfield cadets and explained how much enjoyed flying the PC9/A. ‘It was a beautiful plane to fly and very powerful’, he said. Lachlan spoke to the cadets about his life in the Air Force and how much he was enjoying the Air Force life. Lachlan explained that he was thrilled to have been posted to RAAF Base Amberley in Queensland to fly the C-17A Globemaster Transport Aircraft. He spoke to the cadets about the roles of the aircraft and he hoped to see the world flying the C-17A. Officer Commanding South Australia Wing, Group Lieutenant Martin Ball, thanked Lachlan for visiting Gawler Airfield Squadron and that all the Squadron members were so proud of his achievements and that he was a fantastic role model for the younger cadets showing them what they can achieve if they work hard and are dedicated. Lachlan Johnston remains an Associate Member of the Australian Air League.